Known as one of the best travel destinations in Asia, a Thailand package is very easy on the pocket. The party hub of Asia, Thailand is the go-to destination when anyone thinks of travelling outside India on a tight budget. Be it for bachelorettes, an all-boys vacation, or a simple family holiday, you look for the best value in your Thailand holiday. Most of the time you get your thailand package that is pre-designed to fit your holiday budget and from among them, you seek the best value for your holidays. While a Thailand visa takes only 4 days, your planning and saving for the same has been going on for a long, long time. But up till now, Thailand has been keeping a lot of secrets from you. Secrets that would make your holiday much more than just visiting the glamorous cities of Bangkok and Pattaya. These secrets have left many speechless and when you can do 10 times more, why restrict yourself to just a mere 4- day visit? The best part is that you can now add all of these to your Thailand itinerary. What are these secrets, you ask? Well, besides the busy tourist hubs of Bangkok and Pattaya, here are 10 islands - that although find their place on the map of Thailand, are often overlooked in Thailand itineraries. It is often rare to find an island that gives you the best of both: the party scenes and the relaxed ambience. But that’s certainly not the case with the island of Koh Phi Phi. 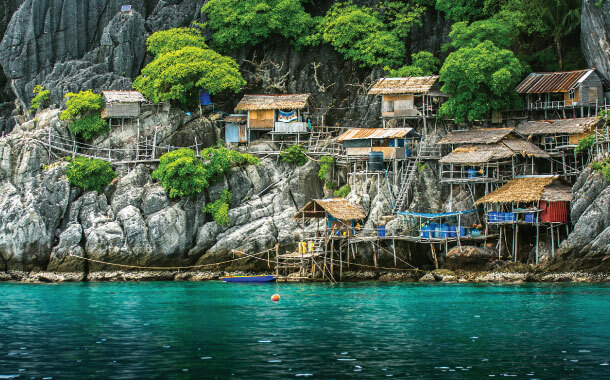 After being entirely rebuilt after a tsunami almost destroyed it, Koh Phi Phi is host to the young, energetic crowd that wishes to stand a class apart. How to get there: The nearest town that has an airport or bus station is Krabi or Phuket. It should ideally take about 45 - 60 minutes to get to the island of Koh Phi Phi. Popular for being among the best places to learn diving, Koh Tao becomes the school of learning to over 7,000 learners every year. 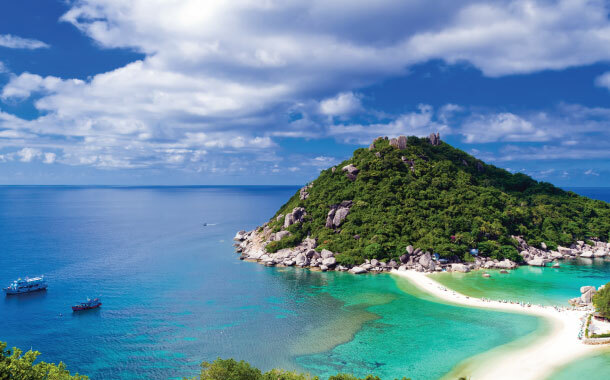 Distance from Bangkok: The beauty of Koh Tao is at a mere 413 kms from the bustling city of Bangkok. How to get there: Take a flight from Bangkok to Koh Samui, and from there onwards a ferry to Koh Tao, which is the most cheapest, and easiest way to get to the island. The third largest island in Thailand, Koh Chang is swiftly earning its name among tourists, albeit it is a lot less crowded than Phuket or Ko Samui. Sharing a border with the neighbouring country of Cambodia, this mountainous island is known for a rich marine life and several waterfalls. Distance from Bangkok: Koh Chang is located closer to Bangkok at a decent distance of 349 kms. How to get there: Koh Chang is well connected to major cities by air and road. The fastest way to get there is by air, while the cheapest and most scenic journey to Koh Chang is by road. This island of Thailand is one of the most vivacious islands that you will ever find. The throbbing music that flows from the innumerable nightclubs stands as a justification of that very statement. Moreover, Phuket also has many shopping areas which are not too far away from the beach. 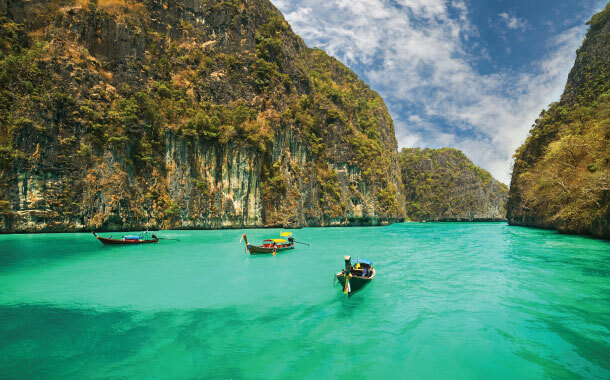 Distance from Bangkok: Phuket is 370 nautical miles away from Bangkok. How to get there: There are 4 major ways of transport from Bangkok to Phuket: flight, car, buses and trains. Every year, the island of Ko Phangan holds an electronic dance festival known as the Full Moon Party. Those who know how to party hard : you need to book an air ticket to this haven. It is said that the electric atmosphere, clubbed with a night of partying under the stars can put the best pubs to shame. 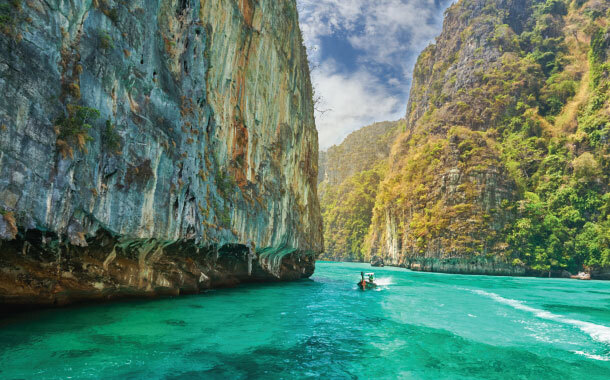 Along with the ‘full moon party’ that Ko Phagnan is famous for; it is also popular with backpackers who wish to dive right into the dense rainforests of this region. Distance from Bangkok: Bangkok is at a distance of 768 kms from this party paradise. How to get there: A direct flight is the best and fastest means for reaching Koh Phagnan. Even by road, Bangkok and Koh Phagnan are well connected with the applied option of taking a ferry. Less than an hour’s ride from Krabi, Koh Lanta is made up of many little islands. This place is frequented by many 30-40 year olds who would like a quiet time while basking under the tropical sun. Apart from this, this destination is a throbbing hub for those who want to venture into the unknown- into the depths of the oceans for snorkelling and scuba diving. Distance from Bangkok: 851.7 kms to be precise. How to get there: Depending in the budget you have, there are multiple options to get to Koh Lanta. If you need to get to Koh Lanta in the shortest time possible, a direct flight is your best bet. For lovers of wildlife, Ko Tarutao is a perfect destination. Being among the 51 islands that belong to the Tarutao National Marine Park Archipelago in southern Thailand, Ko Tarutao is the place where you can see limestone cliffs, which are the spotlight of this lesser visited part of Thailand. There is also a good chance of spotting large turtles who squabble on the western shores of this pristine island. How to get there: The best part of visiting Thailand is the seamless connectivity of almost every city to Bangkok and Ko Tarutao is no exception. You can travel to this island by air, road or rail, with the applied option of a ferry. 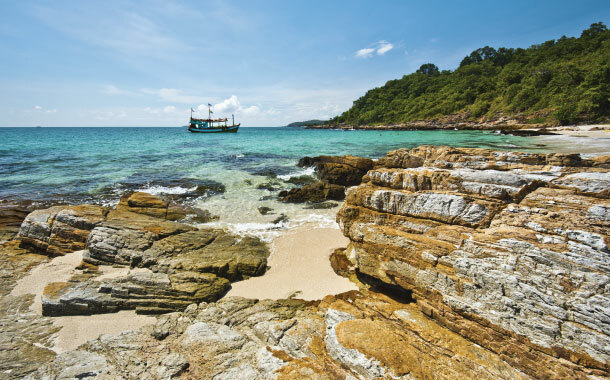 Ko Samet is regarded as being a pleasurable respite from the city bustle of Bangkok. A majority of the island is a national park which makes it even more appealing to visit, as you can stand witness to the greenery while being so close to the opulent beaches of Thailand. The beaches of Ao Phutsa, Au Nuan, Au Naina, and Ao Wai are said to have spectacular sunsets, and are host to cozy accommodations that allow you to take in the best sunset views from vantage points. 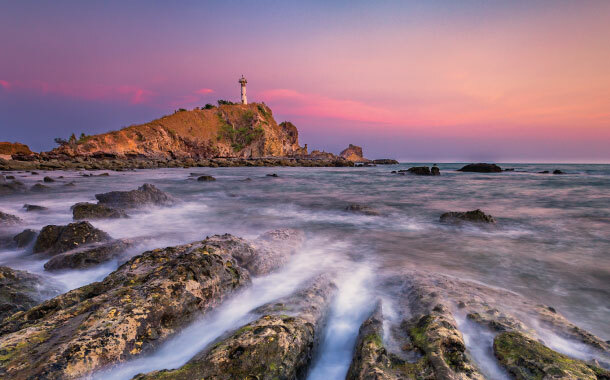 For beaches that are abuzz with tourists, you could pay a visit to the less spoken about beaches of Hat Sai Kaeo and Ao Hin Khok. Distance from Bangkok: Ko Samet is at an approximate distance of 168 kms from Bangkok. How to get there: A bus from Bangkok’s eastern bus terminal will help you get to the ferry piers, from where a ferry to Ko Samet can be taken. It is said that the island of Ko Lipe is so small that visitors can walk around the whole island in a little over an hour. 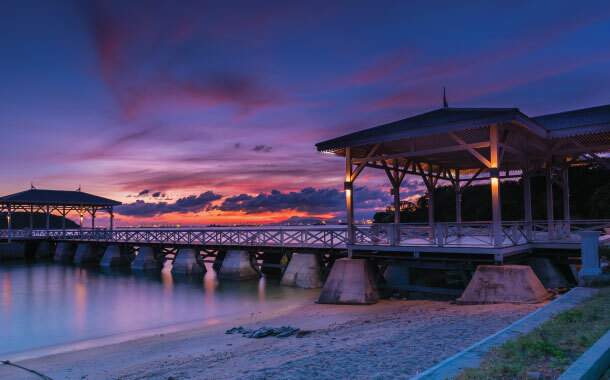 But, the dynamic nature of this island speaks for itself; while the Pattaya beach is frequented by tourists of all ages, the Sunset beach is quieter and more secluded. If you are planning to visit Thailand after your first steps as husband and wife, make sure you add a visit to Ko Lipe while you customise your Thailand honeymoon package. Distance from Bangkok: Bangkok is 818 kms away from Ko Lipe. How to get there: Fly from Bangkok to Hat Yai. From here a bus or taxi will ferry you to Pak barra and from there on to Ko Lipe. At a very comfortable distance of just two hours from Bangkok, this little island is the local’s go-to spot on weekends. Moreover, a fresh sea food meal from one of the many beach-side restaurants is a real treat for the taste buds. Ps: No, we haven’t made a mistake. Koh Si Chang is very different from the island of Koh Chang. How to get there: If you plan to take a taxi or a bus from Bangkok, a ferry will be your applied ride.